CARACAS, Nov 26 2014 (IPS) - Shale fever and the political chess among major oil producers and consumers have put OPEC in one of the most difficult junctures in its 54 years of history. The 12-member group – made up of Algeria, Angola, Ecuador, Iran, Iraq, Kuwait, Libya, Nigeria, Qatar, Saudi Arabia, the United Arab Emirates and Venezuela – may agree to cut output, which would entail sacrificing markets, during its Nov. 27 ministerial meeting in Vienna – the 166th held since the organisation was founded in September 1960. Oil prices, which climbed after 2003 to over 140 dollars a barrel in 2008, plunged as a result of the global financial crisis that broke out that year, but recovered this decade and have remained at around 100 dollars a barrel. In the meantime, the production of unconventional oil and gas began to expand in the United States. Shale, a common type of sedimentary rock made up largely of compacted silt and clay, is an unconventional source of natural gas and oil, which is trapped in shale formations and recovered by hydraulic fracturing or “fracking”. “Fracking” involves pumping water, chemicals and sand at high pressure into the well, a technique that opens and extends fractures in the shale rock to release the natural gas and oil on a massive scale. With the technology and capital available in the 20th century, these unconventional resources were not recoverable. That strategy has run into surprises. For example, 40 years ago no one foresaw that China, along with India and other emerging powers, would become a fast-growing economy with a voracious appetite for fossil fuels, which gave a boost to producers of oil and gas. “But with the high prices, while the exporters financed geopolitical campaigns, like the conflicts in the Middle East or the influence of Venezuela in Latin America under the presidency of Hugo Chávez (1999-2013), the big corporations were investing in technology and new areas of business,” said Habalián. The shale boom “has merely accelerated the results of that permanent strategy by the West. Shale oil is here to stay, the price will drop as the technology advances, and that will bring down the prices of, and set a cap on, OPEC’s oil,” the expert said. Fracking is a costly procedure that requires high crude prices to make it profitable. It is also criticised for its environmental effects, as it involves consumption of enormous amounts of water and the creation of cracks in the rocks deep below the surface, with consequences that have yet to be determined. Shale oil is already a major actor in the global energy market, with daily output of 3.5 million barrels, mainly in the United States, which recently overtook Saudi Arabia and Russia to become the world’s largest oil producer, with more than nine million barrels a day. For decades Saudi Arabia was the biggest producer and the de facto leader of OPEC, because to its production of nearly 10 million barrels a day is added a spare production capacity of two million barrels which has enabled it to increase or reduce output in periods of market scarcity or abundance. The market, of some 91 million barrels consumed daily, of which OPEC contributes one-third, is showing signs of being oversupplied because of the rising offer of shale oil, Europe’s fragile economic recovery, and the slowdown of emerging economies, from China to Brazil. Crude oil is about 30 percent cheaper than one year ago. The European benchmark North Sea Brent stands at 80 dollars a barrel, compared to 110 dollars a barrel at the close of 2013. The U.S. benchmark West Texas Intermediate is trading at 75 dollars a barrel, and Venezuela’s dense cocktail at less than 70 dollars a barrel, down from a high of more than 100 dollars a barrel. Saudi Arabia “appears determined to respond aggressively in defence of its market share, even if that means lower prices for a few years,” Kenneth Ramírez, a professor of geopolitics and oil at the Central University of Venezuela, told IPS. The Saudis are thus apparently facing off with Iran, their rival in the Islamic world – and which, like Venezuela, Russia or Nigeria, needs the biggest possible influx of revenue in the short term – and would discourage, with flows of low-cost conventional oil, the development of its big future rival: shale oil. In addition, according to analyses like those of Habalián and Ramírez, low prices and a market with a greater supply of crude would “punish” nations like Syria or its big supporter, Russia, which is clashing with the West over the conflict centred in Ukraine. In the immediate future, OPEC could opt for the Saudi proposal of maintaining the status quo and letting oil prices slide to 70 dollars a barrel or lower, with the aim of slowing down the development of shale oil while waiting for a recovery of Europe or China and other emerging economies. Venezuela has tried to push another option, with an intense tour by Foreign Minister Rafael Ramírez to the capitals of oil producing countries, from Mexico City to Moscow through Tehran, but conspicuously avoiding Riyadh. The idea is to cut production to shore up prices, betting that the capacity to extract shale oil will decline in a few years. 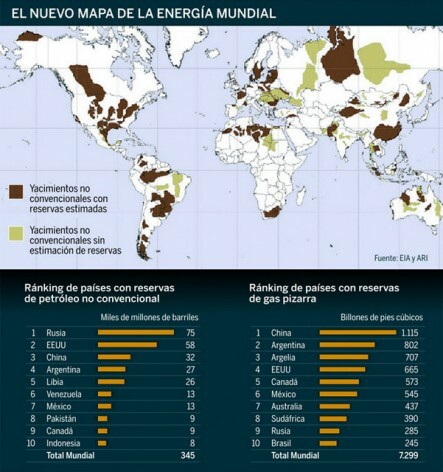 One component that contributes to a move in that direction, said Habalián, is the pressure from environmentalists, especially in the United States and Canada, who oppose the extraction of shale oil and gas because of its impact on water sources, the injection of chemicals and the fracturing of rock deep underground. But in the medium to long term, Habalián observed, a new energy architecture in line with the market stability sought by the West continues to be bolstered, in the face of an OPEC strained by political and budgetary urgencies. One thing about “fracking” that seems to be missing in the stories about same, that the flow of natural gas, for what ever reason, drops off dramatically after initial production, also that leakage to the atmosphere around the drill/well head too. I believe that also holds true for oil, insofar as production goes, meaning a continuing of drilling new wells to maintain flows. 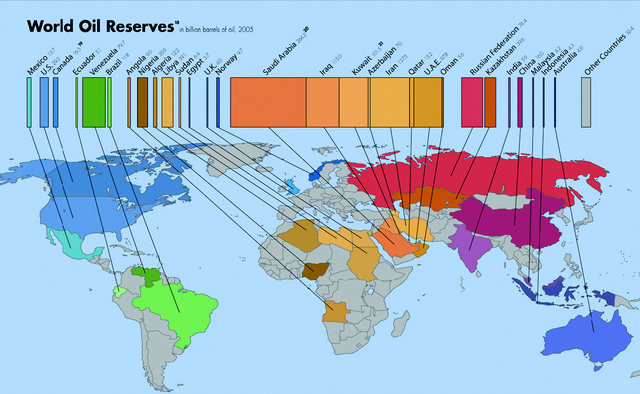 Depending on who says what, there is the thinking that “Shale Oil” production is overrated, that the figures on reserves are not what’s purported to be.